Dr. Hayeri is a former Research Fellow, Division of MSK Imaging at University of California, Irvine Medical Center, Orange, CA, and Dr. Tehranzadeh is Chief of Radiology at Long Beach VA and Professor Emeritus and Vice Chair of Radiology, Department of Radiological Sciences, University of California, Irvine Medical Center, Orange, CA. Back pain is the most common cause of limited activity in people younger than 45 years in the United States. It is the second most frequent reason for visits to a physician and ranks fifth as the reason for hospital admission.1 It is estimated that 18% of the U.S. population experience low-back pain each year. Fortunately, in most cases, the underlying pathology is benign and the pain is self-limited. Noninvasive methods of treatment such as physical therapy and pharmacotherapy typically resolve such pain. Postoperative imaging is used to assess disease progression, positioning of instrumentation, possible complications and the extent of bone-graft fusion. Knowledge of the advantages and limitations of different imaging modalities is necessary for optimal evaluation of patients with spinal instrumentation. Radiologists should also be familiar with different surgical methods used in spinal fusion, types of instrumentation and potential complications to properly appraise postoperative images. Stability is described as resistance of the spine to deformation under physiologic stress. Mulholland8 in a recent review of instability and low-back pain hypothesized that the cause of low-back pain could be due to abnormal disc loading. Currently, the most widely accepted cause of low-back pain and the underlying concept promoting the use of spinal fusion is nonphysiologic movement of the degenerated segment. Most appliances are placed to provide stability during bone fusion, and their function is complete when this has occurred. Be-cause of the morbidity associated with repeated surgery, intact implants are generally left in place for life. 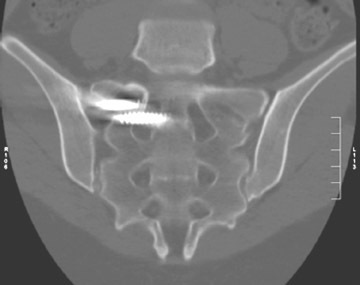 Fractured and dislodged implants are often removed because of the need for revision and the potential for migration of the components, leading to substantial soft-tissue or neural injury. Surgical implants in spinal surgeries are used to stabilize the spine, replace the defective parts and maintain anatomic reduction. Internal spinal instrumentation has undergone considerable advances during the last century. Radiologists should be able to identify the devices most commonly used and understand their biomedical principles and specifications. 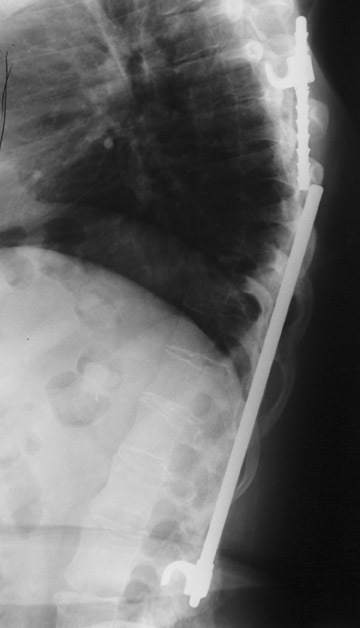 Rods can extend to single or multiple spine segments. They can be single or double, straight, L-shaped or can be cut and fashioned as required. 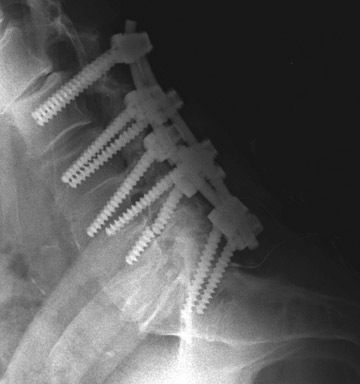 They are attached to the spine by hooks, pedicle screws or sublaminar or interspinous wires or cables. Rods are usually preferred over plates for multisegment fusion because of their ability to span a long segment. The Hartshill rectangle is seldom used today. 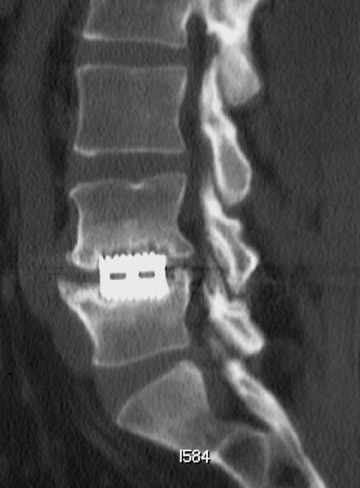 It is a stainless-steel rectangle that attaches to the spine by sublaminar wires and occasionally interspinous wires. Various shapes of plates in different sizes have been developed for anterior or posterior spine fusion.9–11 Some of the commonly used instruments and systems, and their specifications, are summarized in Table 1. These devices can be used when posterior spinal elements are intact. They attach the lamina of 2 adjacent vertebrae. Interbody spacers could be solid (ramp) or hollow (cages). Cages are filled with bone-graft material and inserted into the intervertebral space or replace a vertebra after its removal (i.e. corpectomy). Cages are usually made of titanium carbon fibers, polyetherether ketan (PEEK) or of cortical bone graft. Most cages contain 2 radiopaque markers to identify their position in radiographs and to enable their assessment. They are made in different shapes based on the method of approach to the intervertebral disc. In anterior interbody fusion (AIF), cages are more round in shape, while in posterior interbody fusion (PIF) they are more rectangular. 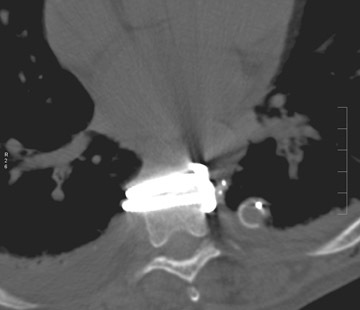 Transforaminal interbody fusion (TIF) cages are more crescent-shaped. Expandable cylindrical or mesh cages are used in vertebral body replacement procedures. 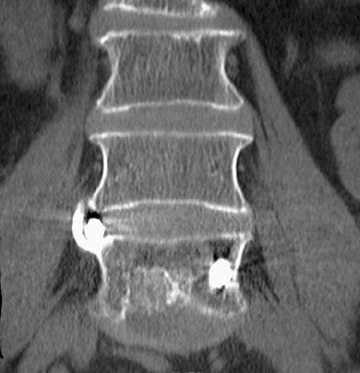 Surgical techniques can be divided on the basis of perceived patient morbidity into minimally invasive or traditional-open procedures performed via either an anterior or posterior approach. In interbody fusion, the intervertebral disc or a complete vertebra is removed and replaced with bone graft. Interbody fusion of the spine can be approached anteriorly or posteriorly. Extreme lateral interbody fusion (XLIF) is a newer surgical approach to fuse L1 to L5 and to minimize disadvantages of AIF. Extreme lateral interbody fusion approaches the anterior spine from the flank. Overall, Lemcke et al. reported that, with regard to the indications and contraindications, AIF and PIF are unquestionably accepted as up-to-date methods.21 The decision to use AIF or PIF is mainly based on the patient’s presenting pathology, spine anatomy, the surgeon’s experience, history of previous surgery and other conditions that may favor one approach over another (e.g. AIF is difficult in the presence of marked vascular calcification).11,22 Laparoscopic interbody fusion can also be performed; however, compared with open surgery, the overall complication rate is higher (19% vs. 14%, respectively). Postoperative imaging plays an important role in the assessment of fusion and bone formation. It is also helpful to detect instrument failure and other suspected complications. It is necessary to compare current images with previous studies to identify any subtle changes and disease progression. Magnetic resonance imaging (MRI) has been used increasingly in recent years since introduction of titanium-based implants with reduced artifact compared to formerly used stainless-steel devices. These artifacts could be decreased even more by changing imaging parameters such as reducing echo time, increasing bandwidth and decreasing voxel size. 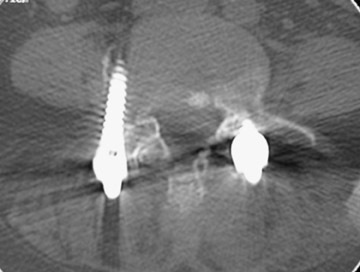 Aligning the implant along the axis of the magnetic field also reduces artifact although it is often not completely achievable due to the multidirectional configuration of most hardware. Spin echo sequences are less vulnerable to magnetic susceptibility artifact and give better quality images compared with gradient echo sequences. 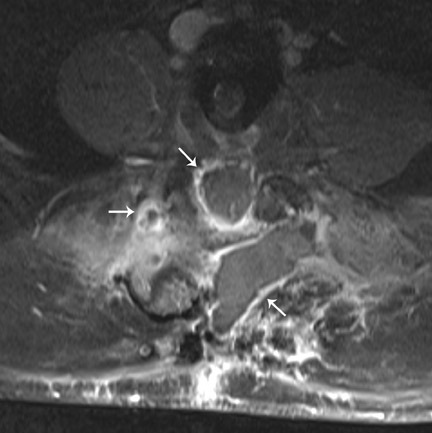 MRI is useful in detecting infection (Figure 9) and assessing recurrent tumor. 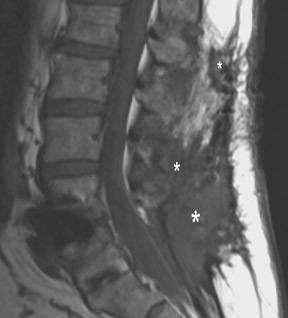 MRI is the modality of choice in assessing intraspinal contents. 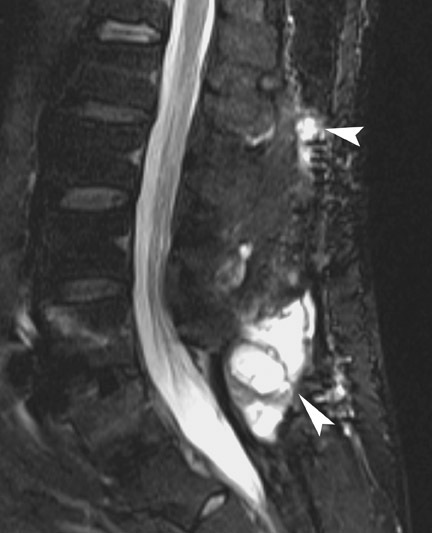 Myelography (Figure 6) is an alternative when MRI is contraindicated or is nondiagnostic because of artifact. Potential complications of spinal surgery vary based on the site of surgery, surgical approach, underlying disease, applied instrumentation, surgeon skill and other clinical factors. Besides the common complications associated with spinal fusion procedures; there are some additional complications based on site, procedure and type of instrumentation. 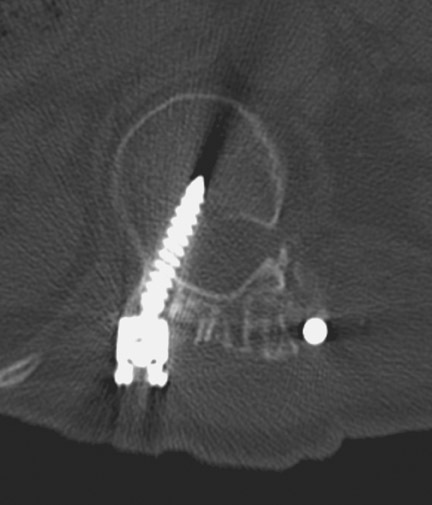 Screws should approach the opposite cortex but should not breach it. 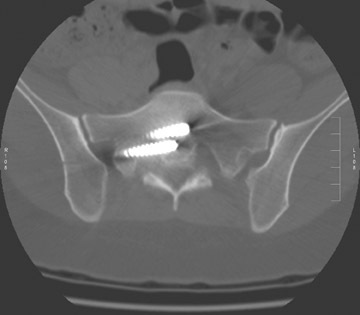 In anterior-plate screw fixation, the screws may back out and impinge soft tissue (e.g. great vessels, trachea and esophagus) or overpenetrate the posterior cortex and impinge on the cord. 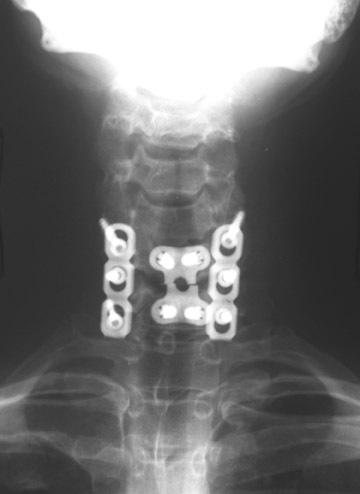 These complications can be prevented by using a cervical-spine locking plate with screw caps (e.g. Morscher). This device prevents the screws from backing out and provides increased holding power removing the need for transcortical purchase with the risk of over penetration. 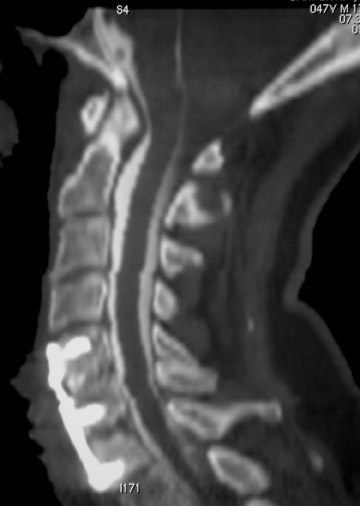 Radiologists face new challenges as the number of, and indications for, spinal surgery grow. Adequate understanding of various surgical techniques and instruments, coupled with improved awareness of the possible complications, are vital when interpreting postoperative studies. Radiologists should carefully compare these critical points with baseline studies to develop a targeted assessment of grafts and hardware. With more familiarity of postoperative spinal images obtained on various modalities and the knowledge of how certain situations (e.g. 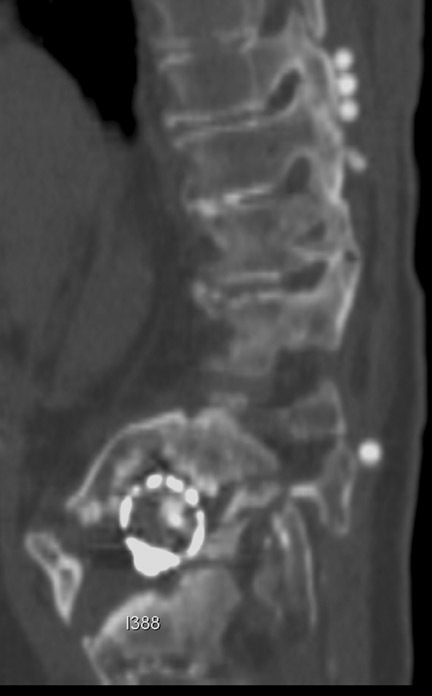 surgical technique and hardware) contribute to failed back surgery syndrome, radiologists can quickly arrive at a precise diagnosis, permitting appropriate treatment and minimizing patient suffering. Andersson GB. Epidemiological features of chronic low-back pain. Lancet. 1999;354:581-585. Deyo RA, Gray DT, Kreuter W, et al. United States trends in lumbar fusion surgery for degenerative conditions. Spine. 2005;30:1441-1445; discussion 1446-1447. Tehranzadeh J, Ton JD, Rosen CD. 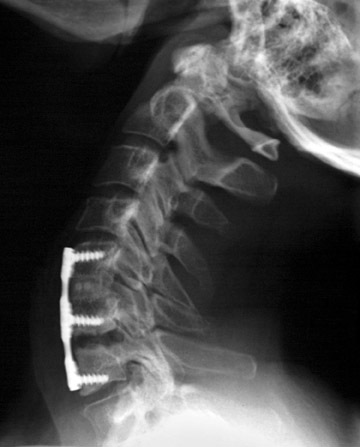 Advances in spinal fusion. Semin Ultrasound CT MR. 2005;26:103-113. Rosales-Olivares LM, Miramontes-Martínez V,Alpízar-Aguirre A, et al. Failed back surgery syndrome. Cir Cir. 2007;75:37-41. Hadra BE. The classic: Wiring of the vertebrae as a means of immobilization in fracture and Pott’s disease. Berthold E. Hadra. Med Times and Register. 1891;Vol 22. Clin Orthop Relat Res. 1975; 112:4-8. Albee FH. The classic: Transplantation of a portion of the tibia into spine for Pott’s disease. JAMA. 1911;57:885-887. 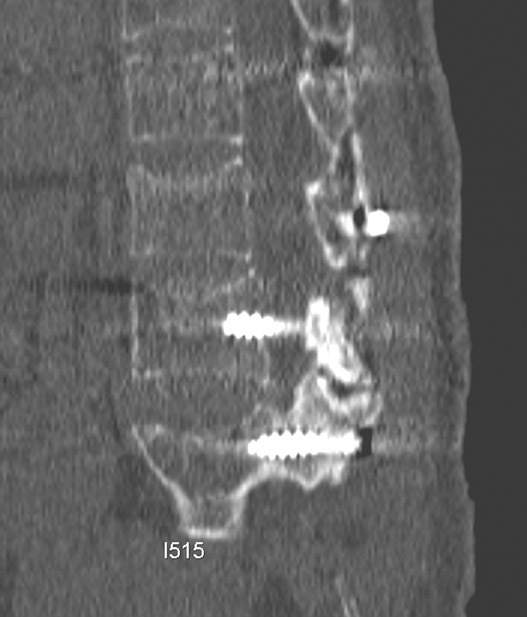 Hibbs RA: A report of 59 cases of scoliosis treated by fusion operation. By Russel A. Hibbs, 1924. Clin Orthop Relat Res. 1988;229:4-19. Mulholland RC. The myth of lumbar instability: The importance of abnormal loading as a cause of low-back pain. Eur Spine J. 2008;17:619-625. Slone RM, MacMillan M, Montgomery WJ. Spinal fixation. Part 1. 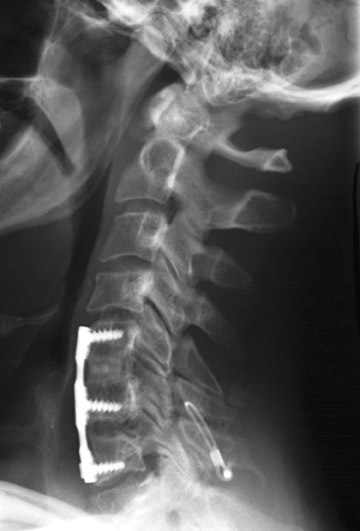 Principles, basic hardware, and fixation techniques for the cervical spine. Radiographics. 1993;13:341-356. Slone RM, MacMillan M, Montgomery WJ, Heare M. Spinal fixation. Part 2. Fixation techniques and hardware for the thoracic and lumbosacral spine. Radiographics. 1993;13:521-543. Rutherford EE, Tarplett LJ, Davies EM, et al. Lumbar spine fusion and stabilizaion: Hardware, techniques, and imaging appearances. Radiographics. 2007;27:1737-1749. Bartels RH, Donk RD, Feuth T. Subsidence of standalone cervical carbon fiber cages. Neurosurgery. 2006;58:502–508. Gercek E, Arlet V, Delisle J, Marchesi D. Subsidence of stand-alone cervical cages in anterior interbody fusion: Warning. Eur Spine J. 2003; 12:513–516. Barsa P, Suchomel P. Factors affecting sagittal malalignment due to cage subsidence in standalone cage assisted anterior cervical fusion. Eur Spine J. 2007;16:1395-1400. Riaz S, Fox R, Lavoie MV, Mahood JK. 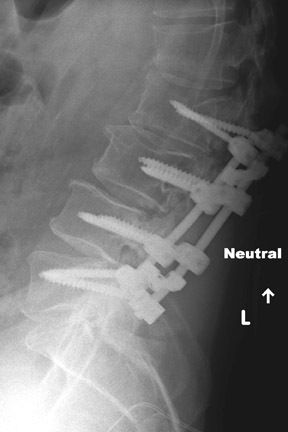 Vertebral body reconstruction for thoracolumbar spinal metastasis – a review of techniques. J Ayub Med Coll Abbottabad. 2006;18:70-77. Slone RM, MacMillan M, Montgomery WJ. Spinal fixation. Part 3. Complications of spinal instrumentation. Radiographics. 1993;13:797-816. Oskouian RJ Jr, Johnson JP. 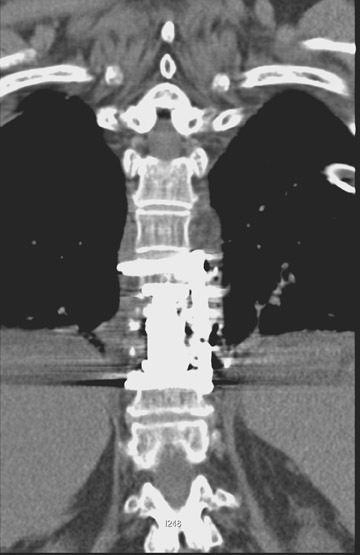 Vascular complications in anterior thoracolumbar spinal reconstruction.J Neurosurg. 2002;96(1 Suppl):1-5. McAfee PC. Interbody fusion cages in reconstructive operation on the spine. J Bone Joint Surg [AM].1999;81-A:859-878. Min JH, Jang JS, Lee SH. 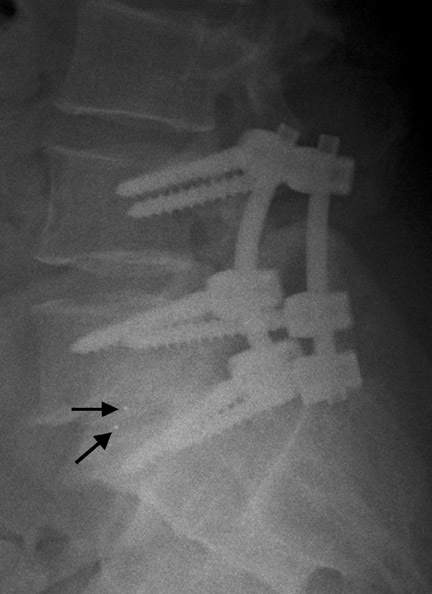 Comparison of anterior- and posterior-approach instrumented lumbar interbody fusion for spondylolisthesis. J Neurosurg Spine. 2007;7:21-26. Lemcke J, Klötzer S, Klötzer R, Meier U. PLIF and ALIF for the degenerative spondylolisthesis of the lumbar spine. Z Orthop Ihre Grenzgeb. 2007; 145:48-54. Blumenthal SL, Ohnmeiss DD; NASS. Intervertebral cages for degenerative spinal diseases. Spine J. 2003; 3:301-309. Ekman P, Moller H, Tullberg T, et al. 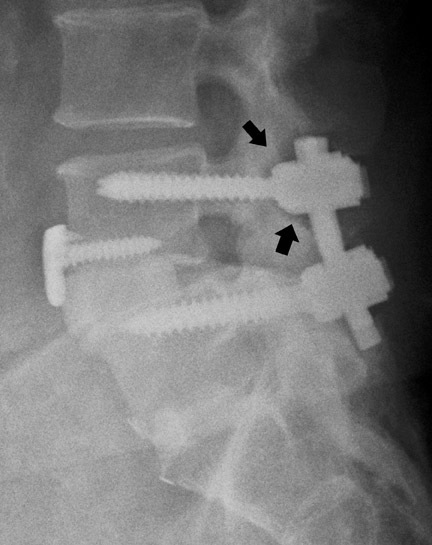 Posterior lumbar interbody fusion versus posterolateral fusion in adult isthmic spondylolisthesis. Spine. 2007;32: 2178-2183. Weatherley CR, Prickett CF, O'Brien JP. 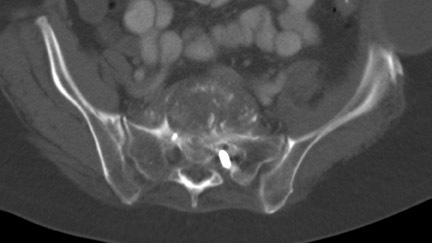 Discogenic pain persisting despite solid posterior fusion. J Bone Joint Surg Br. 1986;68:142-314. Brantigan JW, Steffee AD, Lewis ML, et al. 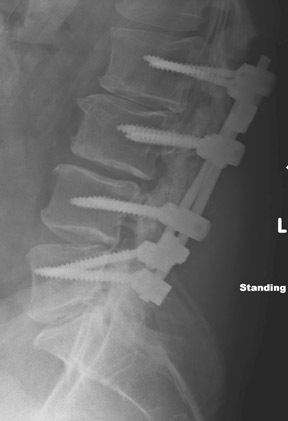 Lumbar interbody fusion using the Brantigan I/F cage for posterior lumbar interbody fusion and the variable pedicle screw placement system: Two-year results from a Food and Drug Administration investigational device exemption. Clinical trial. Spine. 2000;25:1437-1446. Ray CD. Threaded fusion cages for lumbar inter-body fusions: An economic comparison with 360 degrees fusions. Spine. 1997;22:681–685. Heithoff KB, Mullin WJ, Holte D, et al. 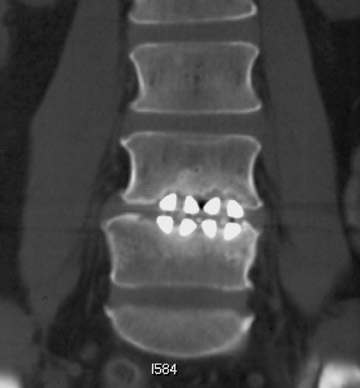 The failure of radiographic detection of pseudoarthrosis in patients with titanium lumbar interbody fusion cages. Paper presented at: International Society for the Study of the Lumbar Spine; June 1999; Kona, HI. Heller JG, Whitecloud TS III, Butler JC, et al. Complications of spinal surgery. In: Rothman RR, Simeone FA, eds. The spine. 3rd ed. Philadelphia, PA:Saunders;1992:1817-1898. Cho KJ, Suk SI, Park SR, et al. 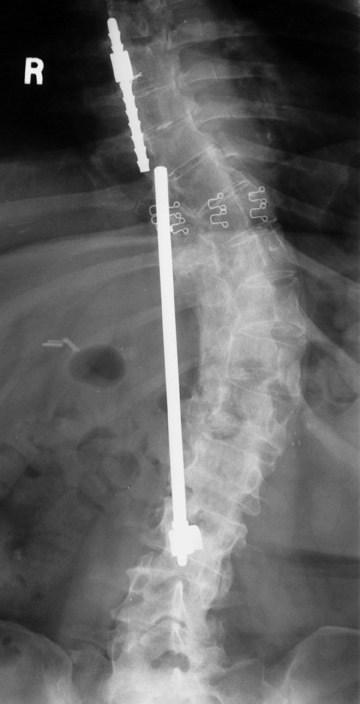 Complications in posterior fusion and instrumentation for degenerative lumbar scoliosis. Spine. 2007;32: 2232-2237. Fountas KN, Kapsalaki EZ, Nikolakakos LG, et al. 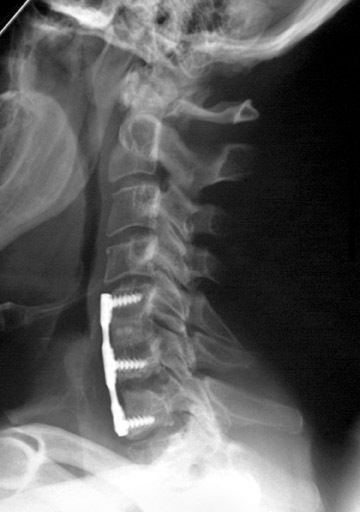 Anterior cervical discectomy and fusion associated complications. Spine. 2007;32: 2310-2317. Lowery GL, McDonough RF. 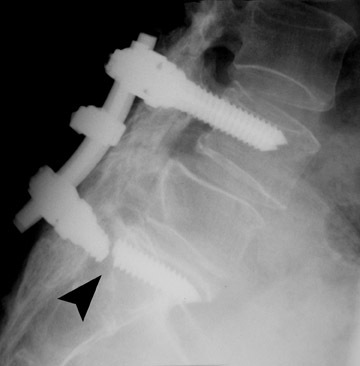 The significance of hardware failure in anterior cervical plate fixation. Patients with 2- to 7-year follow-up. Spine. 1998;23:181-186; discussion 186-187. Spanu G, Marchionni M, Adinolfi D, Knerich R. Complications following anterior cervical spine surgery for disc diseases: An analysis of ten years experience. Chir Organi Mov. 2005;90:229-240. Ohnishi T,Neo M, Matsushita M, et al. 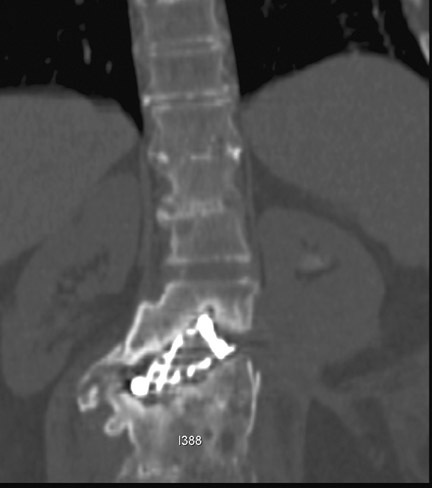 Delayed aortic rupture caused by an implanted anterior spinal device. Case report. J Neurosurg. 2001;95 (2 Suppl):253-256. Young PM, Berquist TH, Bancroft LW, Peterson JJ. Complications of spinal instrumentation. Radiographics. 2007;27:775-789. Suda K, Ito M, Abumi K, et al. 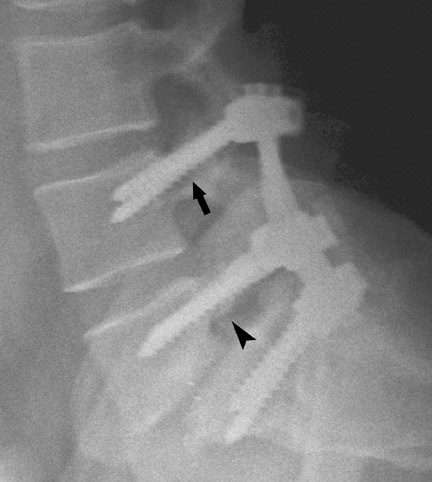 Radiological risk factors of pseudoarthrosis and/or instrument breakage after PLF with the pedicle screw system in isthmic spondylolisthesis. J Spinal Disord Tech. 2006;19:541-546. Schlegel J, Yunan HA, Fredricksen B. Anterior interbody fixation devices. In: Frymoyer JW, Ducker TB, eds. The adult spine: principles of practice. New York, NY:Raven;1991:1947-1959. Emami A, Deviren V, Berven S, et al. 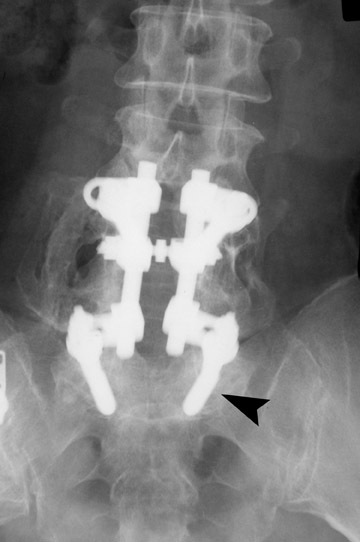 Outcome and complications of long fusions to the sacrum in adult spine deformity: Luque-galveston, combined iliac and sacralscrews, and sacral fixation. Spine. 2002;27:776-786. Diagnostic imaging of spinal fusion and complications. Appl Radiol.